NOW HIRING! Send resume to wheelfunrentalsnola@msn.com or apply online. As the premier recreational rental company in the area, Wheel Fun Rentals offers the ultimate in fun for the entire family, from toddlers through grandparents. New Orleans, LA – As the nation’s #1 recreation destination, Wheel Fun Rentals is excited to announce the opening of the second location in New Orleans City Park. Wheel Fun Rentals offers the opportunity to rediscover the thrill of enjoying the outdoors by providing activities and rental equipment for people of all ages and skill levels. The new location will open for business on Saturday, October 27, 2018. Located at the south-west end of City Park, Wheel Fun Rentals’ second location near Carousel Gardens Amusement Park will offer a full-range of Wheel Fun Rentals’ specialty cycles including the flagship four-wheel Surrey along with several other specialty and two-wheel bicycle options. This bike-only location will be open year-round from 10 AM – sunset on weekdays, and 9 AM – sunset on weekends. Wheel Fun Rentals’ first location in City Park is located on the north-eastern side of Big Lake and offers a full array of biking and boating options including kayaks, canoes, and the brand new Swan Boats as well as specialty cycles, two-wheel and kid’s bikes! Learn more at wheelfunrentals.com/nola. Make sure to visit Wheel Fun Rentals in City Park for a fun-filled adventure! Surrey bikes can seat the whole family, and rental prices start out at $26 per hour. More adventurous explorers can opt for traditional two-wheel bikes and explore the Park and the French Quarter on the self-guided bike tour that is available. Also be sure to ask about the Annual Pass program, which allows members to save 50% off all rentals for 1 year. For more information, visit wheelfunrentals.com/nola-2. Founded in 1987, Wheel Fun Rentals started with four wheel Surrey cycles, evolved into specialty bike rentals and bike tours, and now offers recreational rentals of all kinds from more than 100 outlets in 16 states. 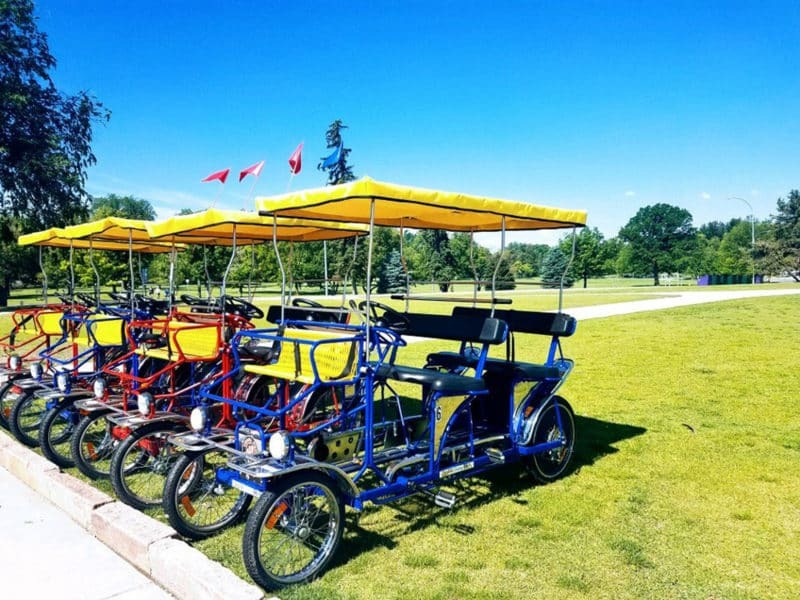 Specializing in unique bikes and tours, Wheel Fun Rentals has been offering clean, healthy family fun and affordable outdoor entertainment to more than 2.5 million customers annually from city and state parks, resorts, and retail outlets through corporate locations and franchised territories. For more information about Wheel Fun Rentals please visit www.wheelfunrentals.com or call 805-650-7770. Follow Wheel Fun Rentals: @WheelFunRentalsOfficial on Facebook, @WheelFunRentalsOfficial on Instagram, and @WheelFunRentals on Twitter. New Orleans City Park is distinguished by its large menu of sports and recreational activities, attractions for children, and its natural beauty. City Park is a 90/10 Park. Self-generated revenue makes up 90% of the $19.5 million annual operating budget; City Park receives no general fund operating dollars from the city or the state. The Park receives approximately $2 million each year from the state for capital projects. City Park has a special place in the hearts of generations of New Orleanians and is a must visit for visitors to the city. The 1,300 acres of parkland provide enjoyment for people no matter their age. City Park is home to the world’s largest collection of mature Live Oak trees in the world. To learn more about the Park, visit NewOrleansCityPark.com.